Ok, so I have good news and bad news. First with the good. I hit the gym today. 2.5 miles on the treadmill! Yay! The bad news: Irish food. Ok thats not being fair. Irish itself is not bad. It was so good and that was the problem. Lets start with breakfast. 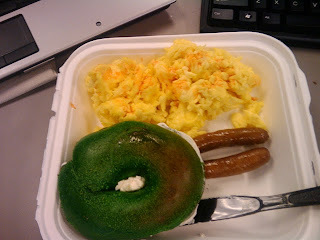 Was it requires that I have a green bagel? Yes. Did I also need eggs and turkey sausage? Umm Yes. So because I ate enough breakfast for 2 people, it was off to the gym for me. 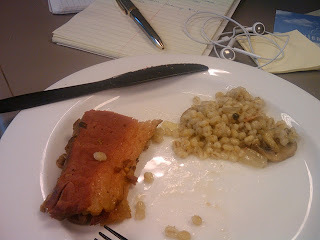 Lunch was up next and no one can go thru a St. Pats day without corned beef. However, because it took everything I had to complete my 45 min on the treadmill, I split my lunch in half (seen here) and saved the rest for tomorrow. Dinner was 2 chicken wings and a few bites of a corned beef and swiss sandwich. I wasnt very hungry so dinner was pretty light. a good start...with a great end.